Last week directors of the Barrier Island Parks Society finally celebrated, after 14-plus years of frustration in obtaining the island’s Rear Range Light (now known as the Gasparilla Island Light) from its various federal landlords, the completion of its extraordinary restoration over this season! What did they do to celebrate? They climbed it! They followed their climb with a full week of reserved visitation and optional climbs, available exclusively to the more than 700 individuals who generously donated to this unbelievable effort. Also, last Saturday was Florida Lighthouse Day, and 108 lucky people climbed the Light and made history as the first-ever civilans to access the structure. Jim Grant, BIP’s representative heading the restoration effort, summed it up. If you haven’t visited the site yet, you will be pleasantly surprised. With the construction and painting complete the grounds have been cleaned up; a beautiful paver path is installed from the state park parking lot to and around the structure with low-voltage pathway lights; old concrete was removed and replaced; the original bollards were repaired and reinstalled at the base; seashell pathways are in place; a walkway through the 7.4 acres of land has been cleared and opened; low-level up-lighting surrounds the structure (will be deactivated during turtle season) and extensive new landscaping surrounds the range light and has been added within the nature trail. What’s next? BIPS announced there will be a ribbon-cutting celebration at the site in November, with more details to follow. The Lighthouse will only be open to the public for climbing one day each month, with few exceptions. A calendar and sign-up will be on the BIPS website, barrierislandparkssociety.org, by the end of the month. 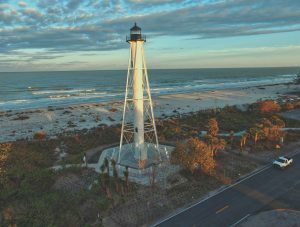 With Coast Guard consent and encouragement, BIPS has filed an application to convert the Lighthouse to a “private aid to navigation,” meaning future operation and maintenance will be the responsibility of the Barrier Islands Park Society. As soon as the permit is approved, BIPS plans to once again turn on the light atop the tower from dusk until dawn. • 12 structural nuts that connected the Lighthouse to its foundation were replicated and replaced. • 34 structural bolts connecting the observation deck to the Lighthouse drum were replaced. • A new front access door and lantern room door were recreated from historical photos and drawings and replaced. • 250 feet of heavy copper rope was buried beneath the Lighthouse, creating a new lightning rod (it appears the old structure was not lightning-safe). • 14 new wooden windows were recreated from 100-year-old cypress sinker logs salvaged from a river near Jacksonville. • A never-used old stock commercial brass lock from 1920 was located and incorporated into the front door. • More than 2,000 deteriorating rivets were removed and replaced. 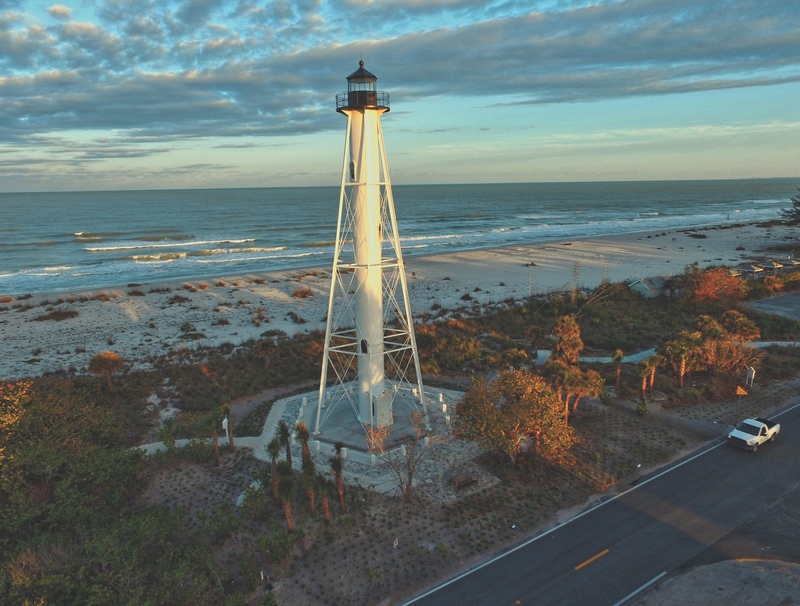 • To sandblast and paint the lighthouse, 80’ scaffold towers were shipped from Orlando, erected and connected to fully encompass the Lighthouse. The scaffolding weighed 80,000 pounds and was wrapped in five large parachute-material tarpaulins to contain debris generated during construction. • The containment took three days to complete and less than three hours to remove. • Approximately 60,000 pounds of abrasive were used to remove the existing paint and rust. • More than 1,500 pounds of deteriorated metal were removed and replaced. • More than 1,000 pounds of rust was removed. • More than 2,000 pounds of old paint was removed. • 5,000 pounds of new paint was applied inside and out. The zinc prime coat on the exterior weighed 33 pounds/gallon, totaling almost a ton and cost more than $500 a gallon. All in all, this was a remarkable achievement and something our community can be proud of and enjoy for decades to come BIPS is continuing to solicit donations, as they have yet to achieve the $1,783,000 goal of the restoration campaign. They are still short of this goal by $200,000. While construction costs have been met totaling over $1.4 million, they have not received sufficient funding to set up a much-needed perpetual endowment fund for future maintenance of our island Lighthouse properties. For information on donating, please contact BIPs at 964-0060 or send a check to “The Light Keeper’s Fund” to BIPS, PO Box 654, Boca Grande, FL 33921. Newer PostOBITUARY: Michael T. Jaekels M.D.